3 weeks ago, we announced a 21-Day “Honor Your Intuition” Challenge, where we were going to share our experiences of listening AND actually actioning on our intuition for 21 days straight. “I can’t do this anymore! I’m walking around, wondering, “What are we intuiting today?” and deciding what’s the best epic thing to use my intuition for so that we can post about it tonight. Yes, it happens. We lose our space even to our own intuition. Whether you listen to it or action on its nudges or not; your intuition is always there, looking out for you. Lesson #1: Your intuition is always on. Bonus lesson: Don’t call something a Challenge unless, well, you want to make it challenging. 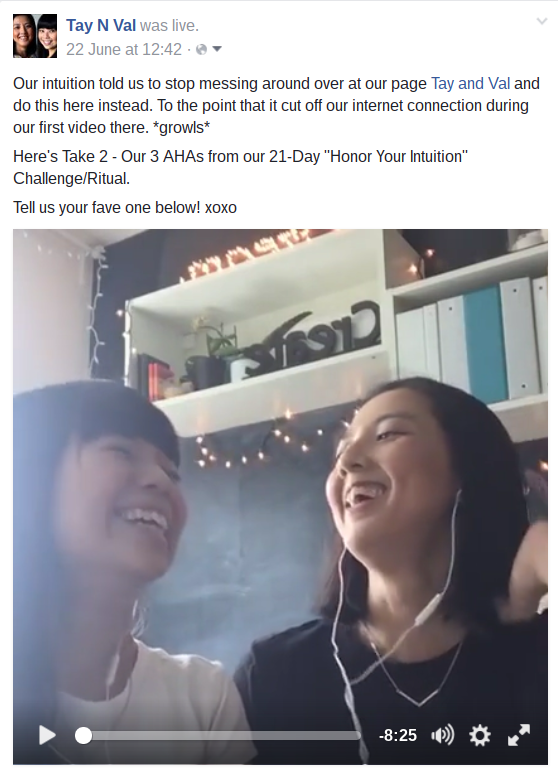 So instead of taking down the Challenge, we renamed it and started calling it our “Honor Your Intuition” Ritual. Lesson #2: Your intuition can be counter-intuitive. Stay with us for a min. Blicks is an art supplies store. Why would they have plexiglass of this size and dimension? We’d spent half an hour researching the catalog on Blick’s website to see if they carried anything close to what we were looking for… and found nothing. Not even remotely close. Val even picked up the phone to ask the store assistant if they might possibly carry such an item, you know… at the back of the store-room, perhaps? But all the signs had showed us no. Yet it was there where everything fell into place. So yes, action on your intuition, even when you know, or think you know, or all of your intelligent research had proven otherwise. The Universe synchronizes everything else to unfold exactly what you need. 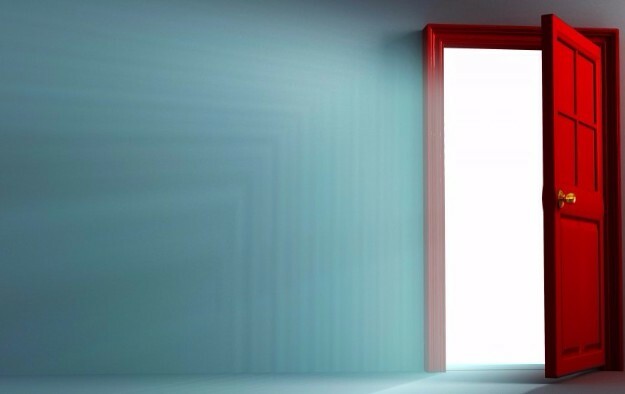 Lesson # 3: Your intuition can unlock and open doors, where there were only walls. One week before we were due to teach our June’s monthly in-person urban retreat, Ignite Your Intuition, we realized we had 1 precious sign-up. We honor every. brave. soul. who’s had the guts to sit in circle with us, with a group of fellow soulpreneurs and deep dive into this work. But 1 person doesn’t make a class. And if we may be candid with you, we were deeply confounded. Usually we’d have half the class filled before the early bird pricing ends. We’ve had no problems selling out our monthly retreats since the first time we’d listened and actioned on our intuitive nudge to offer them. From the intake questionnaire, to curating compatible energies for the circle, to sourcing a venue, to selecting refreshments for the harvest table, to what we’d be teaching and how we’d be facilitating, to the integrative exercises… everything had flowed with elegance and grace… until now. It felt like we’d hit a wall. Some people call this an upper limit, the infamous, almost-mysterious block that everyone goes through as they uplevel into their next level of leadership, success, self-mastery. Intuition: Turn this retreat into an online program. Tay and Val: You’ve gotta be kiddin’ us, right? We’re only 1 week away from class! Intuition: You ain’t got no class if there’s only 1 person, yes? Tay and Val: Then… what about the precious one who signed up? What are we gonna tell her??? What if she asks for a refund? We’d be dealing with *gasps* our very first refund request!!! Intuition: And that scares you because…? 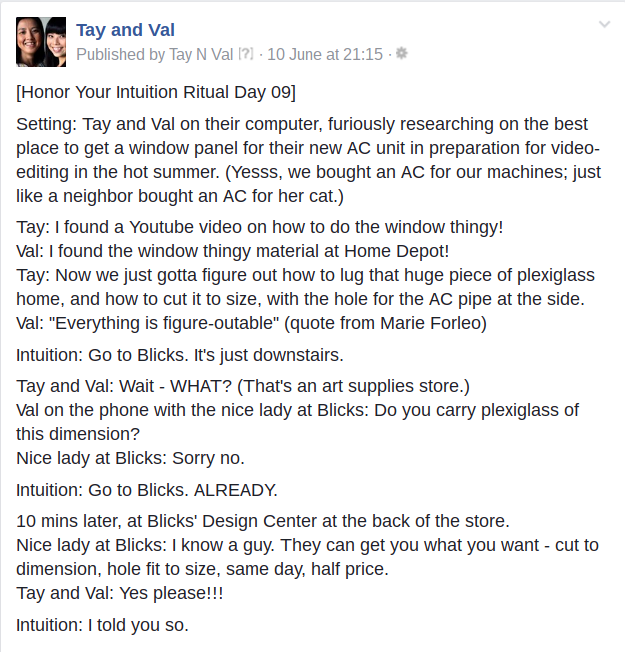 Intuition: Look, I’m here to help. Before you did all this work on me in preparation to teach this retreat, I was calibrated to serve you where you were. We did get pretty far together. But what’s gotten you here, isn’t gonna get you to where you want to be. In this month of sitting with me, honoring me, I’ve upleveled. Which means it’s time for you to uplevel, too. Turn your retreat into an online program. We did say we’d love for our out-of-town folks to join us for these retreat. We have been researching and learning the ins and outs of facilitating online programs. We knew, without a doubt, that an online offering would be our next step – to increase availability, accessibility, and impact of our work. Intuition: You betcha. Turn your retreat into an online program. So we did. We reorganized our 1-day retreat into a 1-month online group program, refunded the first sign-up (which was surprising painless and graceful), and opened the doors to our inaugural online offering. Within the first 24 hours, we had 3 sign-ups; which included our very first-out-of town participant! 3 is our absolute litmus test; because we work with the power of 3. If we get 3, we know we’ll fill the class. The next day, 3 more people signed up. Our upleveled intuition helped us unlocked and opened a door to our next level playing field when we’d hit our upper limit wall. Can we get a hooray for that??? Intuition: You’re welcomed, BTW. Now go write an email to your folks and invite them to step through this door with you. Tay and Val: B..B..But we JUST sent them an email yesterday! (This was on Wednesday morning.) Wouldn’t we be like… annoying or something? Intuition: I’m the one who’s gonna be annoyed if you don’t do it. We didn’t do it. Instead, we thought we’d out-smart our intuition by sharing what you’ve been reading via Facebook Live. Our first attempt on our official Facebook page got disconnected. We thought it was the page, so we hopped onto our personal timeline for our second attempt. It was horrible. Our connection got jammed countless times! You’d think that we’d learnt our lesson by now. We’ll admit – we’re on a steep learning curve for this one! If so, what are you willing and able to commit to, in order to open the doors within your walls? If not, what resistance is holding you back? Is this resistance serving you for where you want to be? Is the resistance yours in the first place? 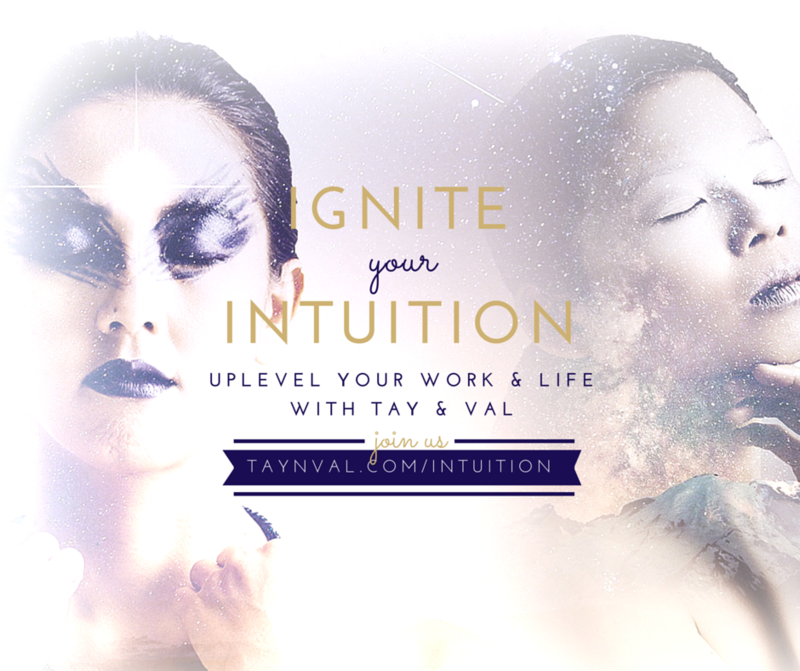 When you’ve decided, boldly click here to book your seat for “Ignite Your Intuition – Uplevel Your Work & Life”. If you’re feeling a still, small voice, consistently (or even insistently) nudging you to join us, do so.